Product prices and availability are accurate as of 2019-04-13 23:22:37 EDT and are subject to change. Any price and availability information displayed on http://www.amazon.com/ at the time of purchase will apply to the purchase of this product. A major audiobook about the future of the world, blending intellectual and natural history and field reporting into a powerful account of the mass extinction unfolding before our eyes. She introduces us to a dozen species, some already gone, others facing extinction, including the Panamian golden frog, staghorn coral, the great auk, and the Sumatran rhino. 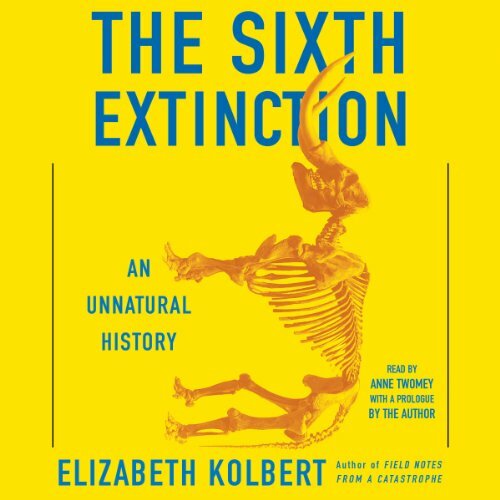 Through these stories, Kolbert provides a moving account of the disappearances occurring all around us and traces the evolution of extinction as concept, from its first articulation by Georges Cuvier in revolutionary Paris up through the present day. The sixth extinction is likely to be mankind's most lasting legacy; as Kolbert observes, it compels us to rethink the fundamental question of what it means to be human.